Mark was born in Morenci, Arizona in 1951, to Juan Ulloa Aguilera and Maria Vidales Aguilera, the fourth of six children. Throughout his life, even through illness, Mark was a ray of sunshine, bringing laughter to all who crossed his path. He was a kind and generous soul, always thinking of everyone around him. His hope and optimism is a gift we will never forget. He is preceded in death by his parents. 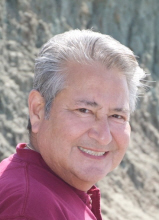 He is survived by his wife of 41 years, Betty Aguilera; daughters Teresa Aguilera and Katy Verga; sons-in-law Ben Hart and Anthony Verga, whom he considered sons; grandchildren Ella, Poppy, Oliver and Zelda; and siblings Jimmy Aguilera, Tony Aguilera, Bob Aguilera, Monica Armstrong and George Aguilera; and many nieces and nephews. Flowers are welcome, or alternatively, donations can be made in Mark’s name to the Leukemia & Lymphoma Society (https://donate.lls.org/lls/donate) or Hospice of the Valley (https://www.hov.org/donate/donate-now/). To send flowers or a remembrance gift to the family of Mark Daniel Aguilera, please visit our Tribute Store. "Email Address" would like to share the life celebration of Mark Daniel Aguilera. Click on the "link" to go to share a favorite memory or leave a condolence message for the family.